Started work on the Walthers Cornerstone Series kit Allied Rail Rebuilders (Walthers Part # 933-3016 and measures 10 x 10 x 6" 25 x 25 x 15cm) on Easter Sunday and with just about 2 hours of work into this kit all the walls have been completed and some parts have been spray painted. The base was modified to fit the single track lead from the turntable and then it was coated with gray primer. The roof sections were coated with a flat black spray paint and allowed to dry with some other parts, such as roof vents and doors were spray painted a silver metal coating. I wanted to see how it looked on the layout having already measured the section many months ago (10"X10"), I wanted to be sure that I was still going to make the grade. Sure enough, the measures were good! I then fabricated a foundation base with two sections of sheet styrene and then hot glued it to the lift out section. I then added thin styrene sheet to the lift out section edges to replace some cardboard that was initially utilized. The thin styrene sheet will provide a better transition for hiding the lift out section. The plan is to apply a layer of scenery base material to the styrene edge and then onto the lift out sections that will not have any building foundations. 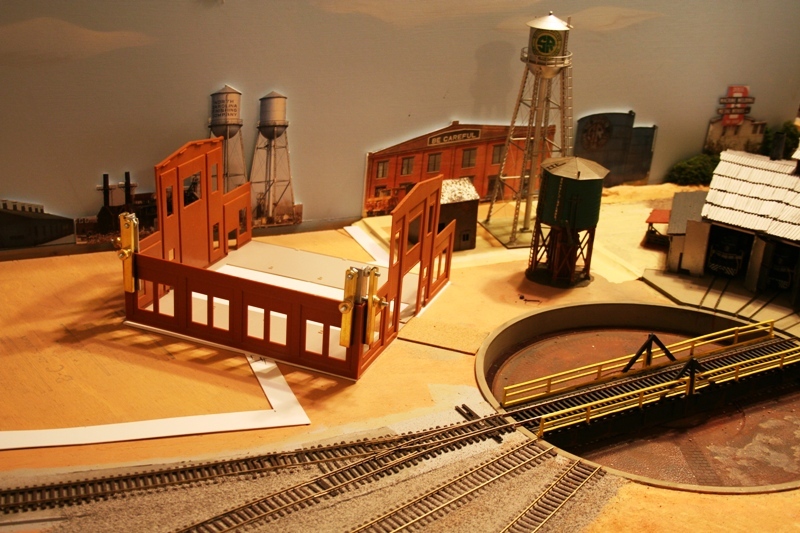 Then add scenery foam material along the this area. To hide the gap I will most likely add a chain link fence about 1/2" in front of the lift out section edge which will provide a view block to further hide any possibility of seeing the gap. The back and side edge of the lift out section should have enough structures and scenery base material to cover any of those gap areas. The styrene sheet overlaps from the lift out section and onto the permanent benchwork plywood material about 1/2" in all areas.